Saturday, January 26, 08:30 AM to 05:00 PM This event has ended. The 2019 KISS Country 99.9 Chili CookOff is right up your alley if you love live country music, the world's best chili, outdoor events and concerts filled with fun, or if you just like the thought of getting together with friends and family at one of South Florida's top attractions for the New Year. The Chili CookOff is an annual SoFlo event that's now in its 34th year. If you've never been to the CookOff before or are planning on going this year, you're probably wondering where to buy tickets, what to expect, what to bring, where to park, and more. Keep reading to find out answers to all your questions, as the CookOff is right around the corner. What Is the 2019 KISS Country 99.9 Chili CookOff? South Florida's biggest country music festival that also hosts a colossal chili cooking competition. The festival is presented by KISS Country 99.9, a radio station that any SoFlo country music lover has programmed as one of their favorites. When Is the 2019 KISS Country 99.9 Chili CookOff? The 2019 version of this SoFlo festival and outdoor concert will be held on Saturday, January 26th. The main gates will open at 8:30 am and close at 5:00 pm. Where Is the 2019 KISS Country 99.9 Chili CookOff? The CookOff will be held at C.B. Smith Park in Broward County's sunny city of Pembroke Pines. Here's the address to put into your GPS (while you listen to KISS 99.9 on the way, of course): 900 N Flamingo Rd, Pembroke Pines, FL 33028.
Who Will Perform at the 2019 KISS Country 99.9 Chili CookOff? As usual, this annual SoFlo staple for country music will have a ton of top-notch artists performing on two stages, headlined by Brooks & Dunn. Other country artists set to play include Luke Combs, Rodney Atkins, LOCASH, Jon Langston, Tyler Rich, James Barker Band, Runaway June, Adam Hambrick, and Dylan Schneider. Can Kids or Babies Come to the 2019 KISS Country 99.9 Chili CookOff? Absolutely! The Chili CookOff was designed for an all-ages crowd. Kids cannot get in free, however, and everyone will need a regular purchased ticket for entry. That includes babies too. As a side note, you can bring a baby backpack with baby formula with you as long as you bring a baby along! Pre-sale discounted tickets for the Chili CookOff are now sold out, but you can buy regular priced tickets here. General Admission "Mild" tickets are $65 per person, with no parking pass included. "Spicy" General Admission tickets will soon be available for $70, and on the day of the CookOff, you can buy "Hot Damn" GA tickets for $75. What does a general admission ticket get you for 65 bucks? Besides getting you into the gates, it allows you to experience the Line Dancing Tent, the Ford Blue Lounge, both stages loaded with country music stars, and food (beyond just chili) and drink from over 20 vendors. You can purchase a Twin Peaks Ultimate VIP Sports Lodge Ticket for $339 per person in its "Medium" version here. This comes with more perks, but parking is not one of them. You'll still have to pay separately for that. The "Spicy" VIP version will be available soon for $359. What does the VIP ticket get you? A private viewing area that's raised, complimentary water bottles, free food samples from local vendors, VIP bar access with discounted drinks, four free drinks to include liquor, beer, or soda, and VIP fast-lane access to bathrooms, which is an obvious must after all that food and drink. As a bonus, a VIP ticket will also bring "surprise and delight moments." Oh, and you'll also get access to all the regular food and drink vendors, the Line Dancing Tent, Ford Blue Lounge, and the two stages of country music performances. Don't be surprised if you see a not-so-convenient "convenience fee" on each ticket that could range from $5-15. Tickets can be shown via mobile phone or print-out, as long as a valid barcode is visible. As for availability, both GA and VIP tickets are selling out fast, and could be gone by the time you read this, so act quickly! Is There Assigned Seating at the 2019 Kiss Country 99.9 Chili CookOff? For VIP ticket purchasers, yes, there is. General Admission tickets do not have seating within the CookOff's boundaries. If you have a regular ticket, it's a good idea to bring a low-rise chair for comfort throughout the event. Parking passes are $25 online per carload if you buy them now, or $40 cash only at the gate. They are mandatory! If you buy the parking pass online, merely show the ticket on your phone to the attendant. There's no need to print it out. You will need a parking pass and an event ticket to enter the lot, so purchasing ahead of time online will not only save you time, it'll save you money too. Speaking of saving time, you can expect heavy traffic on Johnson Street, Taft Street, and Pines Boulevard, so don't wait until the last minute to show up. No road closures are expected. It should be noted that there is no tailgating allowed in any Broward County parks. You cannot park a limo, bus, party bus, RV, or box truck in the parking lot either, so keep that in mind if you're planning on going all out regarding transportation. The parking gates at Pines will open up at 12:30 am on January 26th and 6:30 am on Taft. If you're being dropped off at the Chili CookOff, the Rideshare drop-off area for Lyft, Uber, etc. is located on Johnson Street's east side where it intersects with Flamingo Road. Handicapped parking will be available at a short walking distance from the CookOff's entrance. There is no special assistance available for disabled attendees to get inside the gates. There will be a handicapped accessible viewing area, however, as well as handicapped restrooms. Before entering, there will be a security check that may include a full pat-down and having to empty all of your bags and pockets to have your items examined. Any prohibited items will be confiscated. They will not be held nor returned, so pack accordingly. Potential projectiles, footballs, frisbees, etc. For additional information, visit WKIS.com. 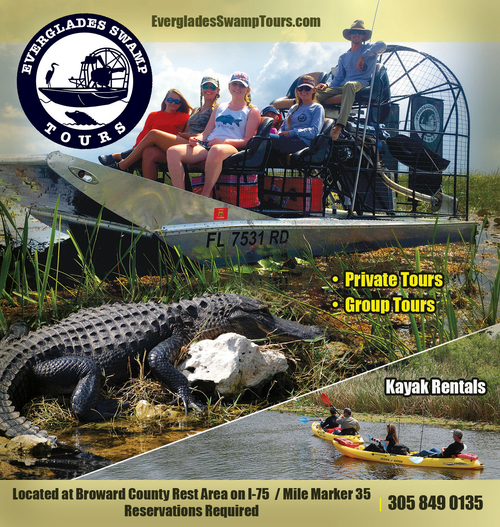 The park is accessible via Broward County Transit Routes #5, #7, #16, #23, and 95 EXPRESS.